During the 1700s, English potteries produced huge quantities of wares, like this teapot, for export to the American colonies. Current fashions, particularly oriental themes, inspired pottery designs. Playful, exotic shapes like this camel were common. Tea was introduced to England’s social elite in 1650. An elaborate etiquette of tea consumption developed, requiring the finest and most fashionable silver and Chinese porcelain teapots. By 1740 tea was widely consumed by all, but serving it still required a high degree of social ritual. Less expensive but stylish teapots like the camel met the needs of the middle class. To achieve the fine detail of this stoneware teapot, potters poured liquid clay into a plaster mold, removed the mold after the clay hardened, and then fired the teapot at a high temperature to produce the stoneware body. Though strong and beautifully formed, stoneware teapots were not as elegant or as expensive as those made of porcelain. 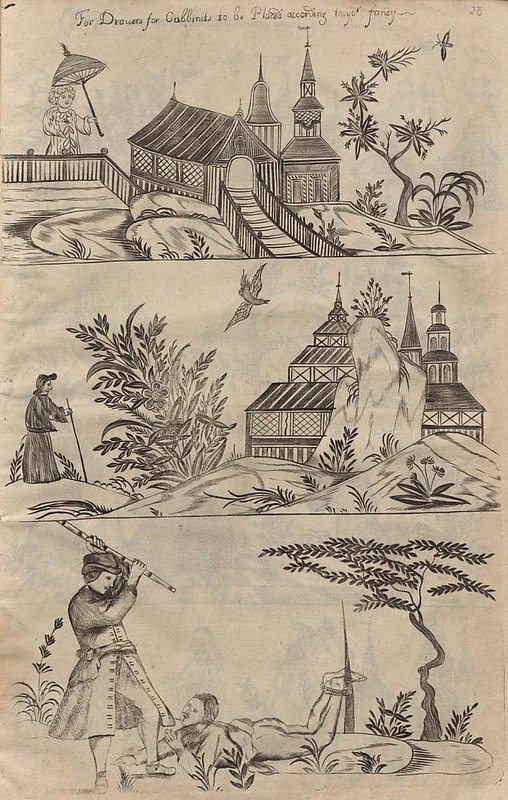 Chinese-style images from the late 1600s were revived in the 1700s and reflected the public’s infatuation with all things oriental. 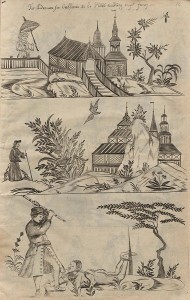 Such designs inspired decoration on furniture, textiles, ceramics, and other goods. 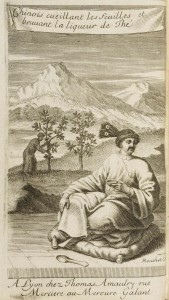 The craftsman who created the mold for the Staffordshire teapot shown here reproduced in relief on the camel’s “howdah” a figure with an umbrella, from a plate in Stalker and Parker’s Treatise on Japanning. 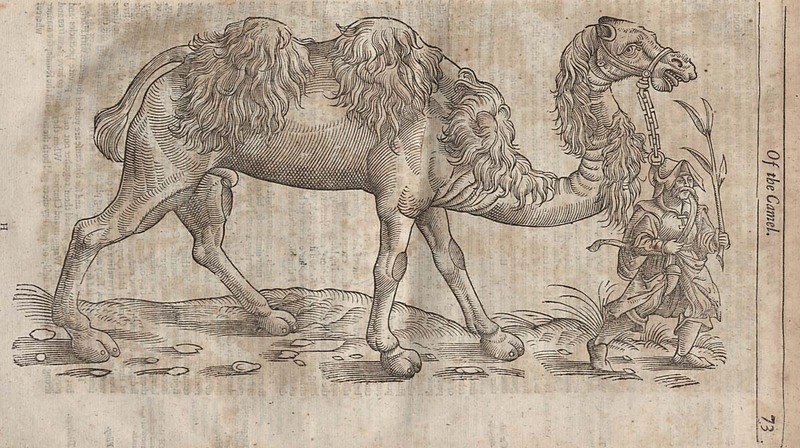 Images of exotic animals fascinated the public and inspired designs like camel-shape teapots. This book is a compromise between fable and biology intended as much for Sunday reading as for serious reference. Fanciful and morally instructive fables about exotic animals are jumbled with practical instructions on the feeding and treatment of diseases for more pedestrian beasts. French entrepreneur Nicholas de Blegny specialized in the promotion and sale of supplies and equipment for the newly introduced beverages of coffee, tea, and chocolate. 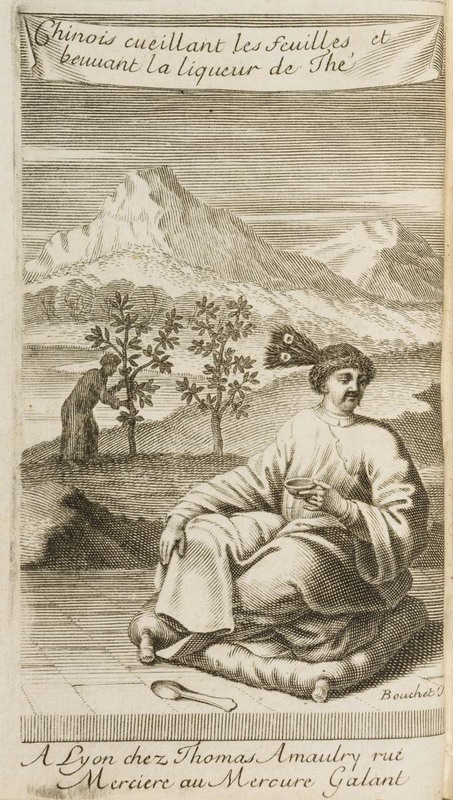 As one of the earliest books on tea, Blegny’s volume contributed significantly to acceptance of the exotic beverage. The “Salt Stone Cups & Saucers” in the receipt refer to salt-glazed stoneware, the same type of ceramic as the teapot. 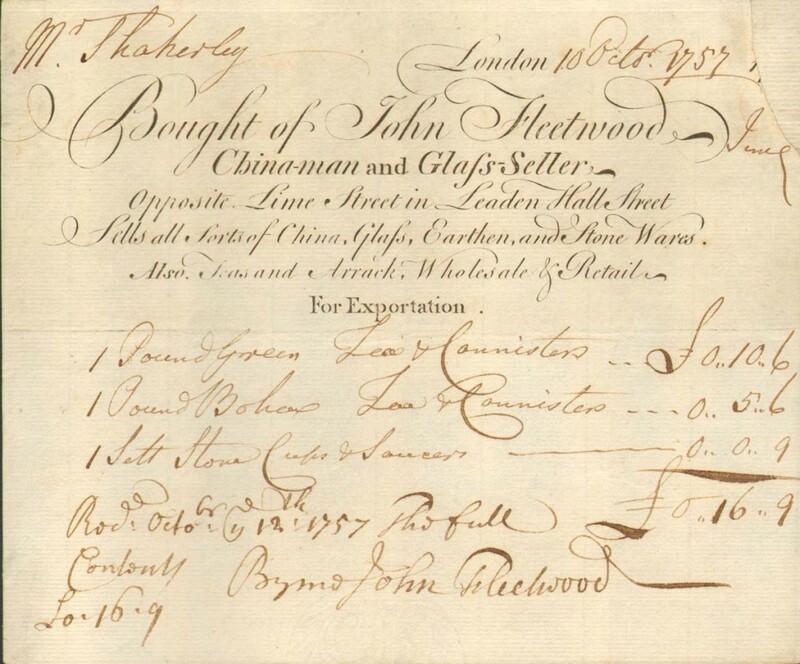 English merchants like Fleetwood shipped glass, ceramics, and related commodities to the American colonies, among other destinations. Customers found it convenient to purchase tea caddies, tea cups, and teapots as well as the green and black teas to fill them from a single source. 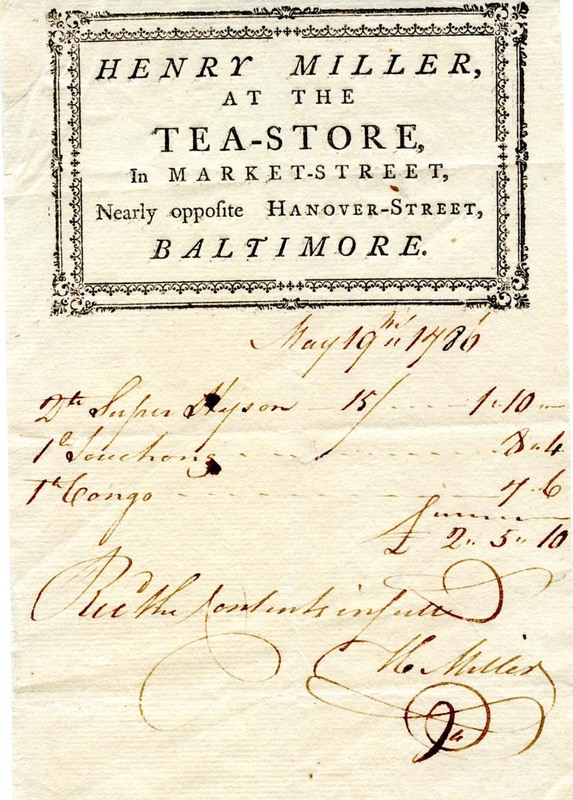 The importance of tea throughout the 1700s allowed a Baltimore merchant like Henry Miller to make his living from selling the commodity. Because of their social and economic significance, teas were sold by names such as Congou, Hyson, and Souchong. 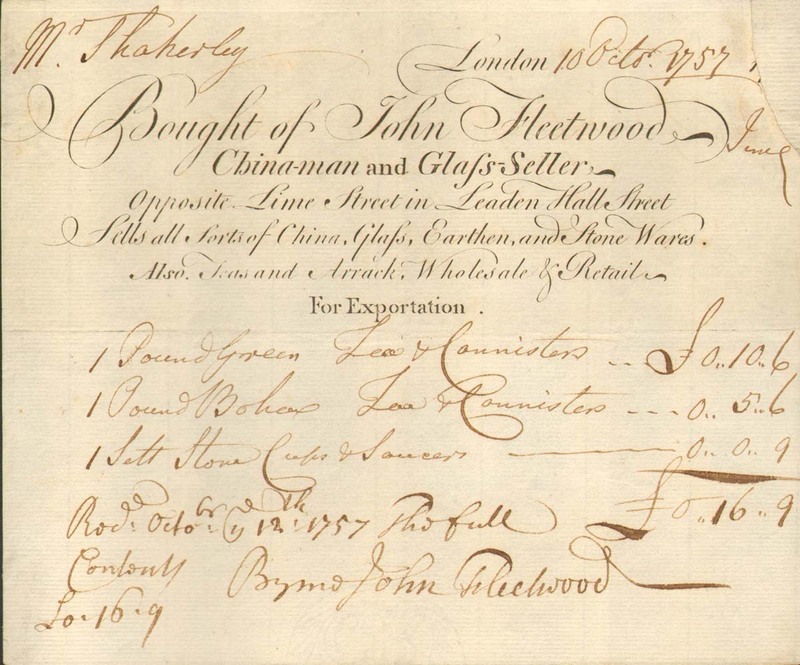 Josiah Wedgwood, England’s leading Staffordshire potter, was also an innovative industrialist. After labor unrest at his factory, Wedgwood issued this address to remind workers of their improved housing and wages. 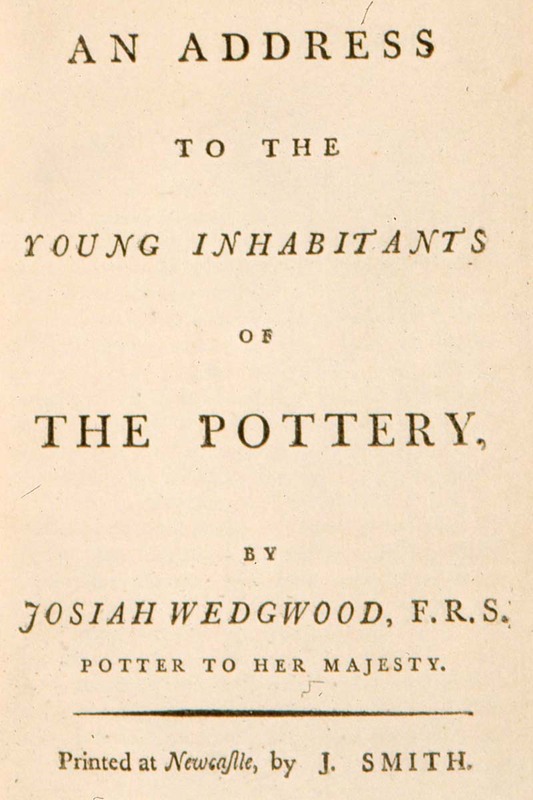 Wedgwood had replaced inefficient craft practices with a factory system emphasizing quality and efficiency. These changes improved the product and allowed the pottery to create more complex and sophisticated wares. 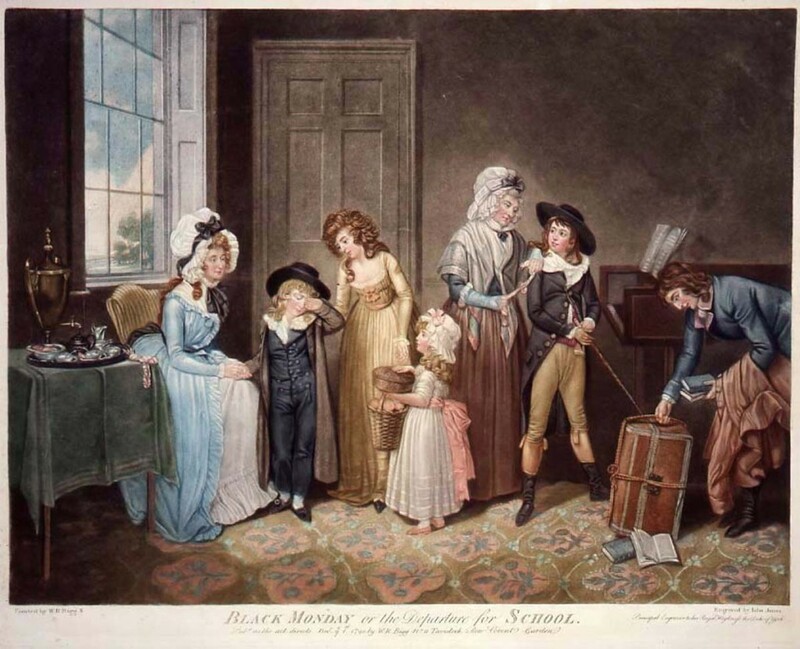 This middle-class domestic scene features a woman supervising the tea table as the family is about to send a child off to boarding school. The orderly tea table symbolizes the stability and prosperity of the English family, with the woman in a traditional position of authority. 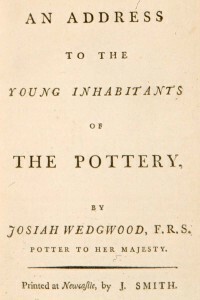 Enoch Wood, the owner of a pottery factory in Staffordshire, England, commissioned this book documenting the entire process of making earthenware pottery. 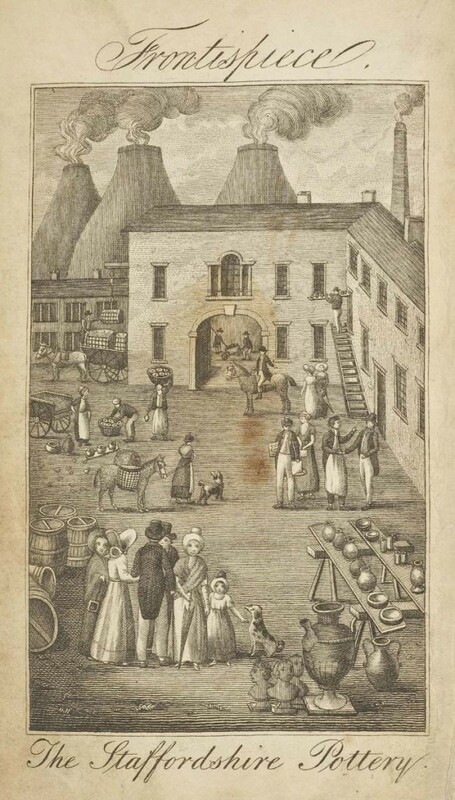 The frontispiece illustrates a busy pottery yard with active kilns and tourists. 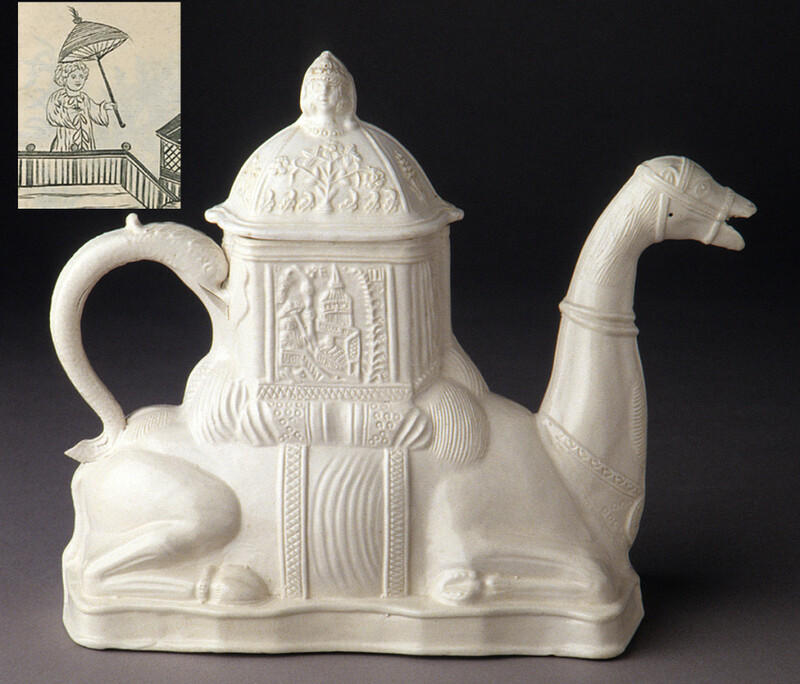 The camel teapot was produced in a manufactory like this using the slip casting process that is shown here.